There were two black candidates in the 2004 presidential race : Al Sharpton and Carol Moseley-Braun. 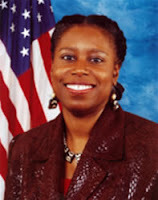 It appears there will be two black candidates in the 2008 cycle as well, Senator Barack Obama and now former Congresswoman Cynthia McKinney, right. She will be nominated this week in Chicago, Illinois to be the presidential nominee of the Green Party. Her name will be on the ballots of approximately 36 states. Will she, combined with Ralph Nader, take enough votes away from Obama to lose in November?